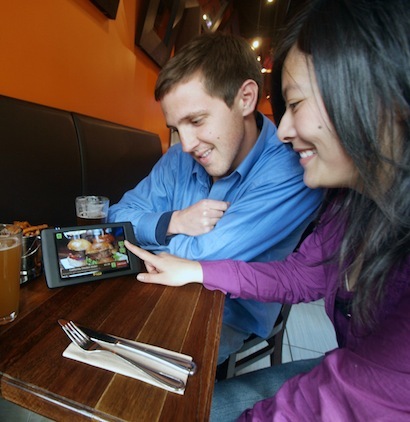 E La Carte makes 7-inch tablets that are designed specifically to help restaurants do better business. Easy, in the age of the iPad? Yes–but they beat it to existence by years, and just earned one of Lightbank’s biggest investments to date. Lightbank, the venture vehicle created by Eric Lefkofsky and Brad Keywell of Groupon fame have just pushed $4 million of funds, one of its biggest investements thus far, into E la Carte–makers of the Presto dedicated restaurant tablet devices. Lightbank is betting that in a newly iPad-invigorated world, dedicated single use tablets will sell and will be more readily adopted, perhaps even sought out, by public-facing businesses. Presto was dreamed up in 2008, and it’s currently in use in around 150 restaurants in the Bay area. But don’t dismiss this as a small scale whimsy: The system offered up by E la Carte lets diners choose their food automatically, reducing the need for wait staff, and to play games at the table. The company claims the device can boost revenues by 12%. The seven-inch touchscreen tablet with wireless connectivity pre-dated the iPad by two years, and seemingly presaged the revolution in mobile payments by incorporating an in-tablet credit card swiper and processing software. The Presto hardware has a 20-hour battery, which for the time being easily outperforms the iPad and many of the current crop of Android tablets on endurance. Suri explained that the device runs a custom UI on top of a Linux core, and it’s thanks to this task-specific design that it performs so well. It’s also ruggedized to survive much more sustained pawing from restaurant customers than a fragile iPad may be able to withstand. Suri’s enthusiasm about his “software in physical environments” creation is evident. He says, “It’s cool because we’re almost inventing a new category. There are web apps, and mobile apps [but] who’s putting software into places where you can go and engage with software in places you didn’t before?” He’s thinking about restaurants and movie theaters primarily. The design of the Presto could keep customers engaged with the device in a way that Suri thinks would not be likely with a general tablet like the iPad. E la Carte now has serious expansion plans, with some 200 companies across the U.S. waiting to buy their systems, according to Suri. Its 100% immediate growth potential probably influenced Lightbank’s investment decision. Dedicated task-specific devices can be more efficient in use (and cheaper to manufacture) than full-on multi-purpose tablets as well, a lower-overhead detail sure to please financiers. But in and of itself, E La Carte is not planning to become a phenomenon like the iPad. What its steady success and a new high-profile cash injection tells us is that the tablet trend is here to stay, and proliferating in ways that we may not have imagined.